After 30 years working with couples and working on my own relationship, I’ve seen the best and the worst. I’ve been asked many times for advice and I myself have sought advice and counseling to strengthen my relationship as well. One of the most common success factors in relationships is a willingness to grow, change and transform. As we explore in my upcoming book, The Heart of the Fight, relationships aren’t always easy, but conflict isn’t always a negative sign. Conflict and active engagement with your partner can be a powerful catalyst for transformation. Participants in our programs at Wright Living often experience lower rates of divorce and more harmonious relationships. (A survey of our relationship coaching program revealed divorce rates were somewhere around 4%, much much lower than the national average.) I believe this stems not only from the success of our programs, but also due to the attitude and type of person that participates—these are real people seeking real change and real growth. The very fact that you’re looking for relationship advice and seeking to better your relationship reflects a very important first step to success: you’re looking for change. You understand you must grow, adapt and work on your relationship. You must actively engage with your partner, and as an individual, to achieve what you want and see those things you find most important in an intimate relationship. This, my friend, puts you ahead of the curve already. Here’s some of our most important relationship advice. It’s the best relationship advice you never got. Relationships are all about engagement: actively engaging with your partner, being open, honest and genuine with them, and not being afraid to get a little messy. Relationships, after all, are rarely neat and tidy. They’re fraught with intimacy, emotion, feelings and connections. They’re built on hopes, desires and the innermost yearnings of our hearts. These are big things and the very fiber of our matrix. People often shy away from conflict and expression in relationships. Small resentments fester like a tiny pebble in a shoe that eventually causes a blister. If you catch it early, if you discuss it—remove the pebble and sooth the irritation—you can move forward; but if it goes unchecked and ignored, eventually you’ll find each step more and more painful. When you get down to the deeper underlying meaning of the fight, you have to ask yourself what are you really fighting for? Is it for personal validation? To soothe an irritation? Or are you fighting to come to a stronger outcome for the relationship itself? If you reframe your ultimate goal, you may find that although you and your partner are experiencing conflict, you’re still yearning for the same result—to love and be loved in a mutually fulfilling relationship. “He never helps around the house,” or “She’s just like her mother…” are common relationship complaints. Pointing fingers, placing blame and hurling generalizations and accusations can feel productive—we’re getting OUR point across; we’re expressing OUR feelings. However, we’re not taking responsibility for ourselves. You are responsible for your happiness and satisfaction. If you’re looking to a relationship to give you something you haven’t found within yourself, then, as harsh as it may sound, you will never find it. As human beings, we need to connect. We crave intimacy, closeness with others, physical touch, affection and partnership with others. Wanting a relationship is at the core of our desires. From a transformative approach, our relationship should support us. It should be a womb in which we can grow. Often we look at what a partner is doing or not doing as a solution to “fixing” our relationship, but blaming, nagging or accusing a partner is not transformative or productive. Instead, we need to look at our yearnings within the relationship and ask ourselves if we’re expressing those yearnings clearly. It’s not “wrong” to wish your husband did the dishes more often or to wish your girlfriend was more physically affectionate, but you are responsible for the way you express those desires to your partner. Ask yourself if you’re making your feelings and yearnings clear. Own your feelings and take personal responsibility for your role in the conflict or the frustration. Although many of us may wish our partners could read our minds, I can assure you I have yet to meet any two partners that were psychically connected. You must take responsibility for your desires. A relationship is a two-way street. It’s a reciprocal relationship and that means one side cannot be solely responsible for issues that arise. Too often we get caught in the pseudo-engagement of the “Blame Game,” which feels constructive, but really it just continues to build resentment, keeping you locked in the drama triangle. It creates a lot of energy, making you feel like you’re relating, but really you’re just spinning your wheels. Remember that you and your partner are part of a system and you each take part in it. This also works in reverse—you can only take 50% of the blame. If you’re a rescuer or a fixer who thinks you can resolve all the issues yourself, then you need to reassess how much blame you’re taking on as well. Engaging together with your partner, actively taking responsibility for your roles and focusing on transformative and positive resolution will add depth and intimacy to your relationship. Understanding where underlying feelings are coming from and working together to address these feelings can keep things from escalating beyond the point of no return. Don’t give up on a relationship just because there’s conflict or because it’s not always “fair.” There are no perfect relationships and fairytales are just that…real relationships are much more satisfying, genuine and supportive. The truth is, all relationships require work. Healthy relationships are in a constant state of growth and transformation. If your relationship has reached a point where things feel a little “stale” or even just routine, then it may be time to recharge, refocus and roll up your sleeves. Your relationship should be a source of support and mutual satisfaction. As our lives get busy and our careers require attention, many of us feel like our relationships become routine or as though we’re just “going through the motions.” Maybe the relationship isn’t completely “broken” per se, but it doesn’t ignite that same spark of passion or that same fulfillment for us that it once did. There are many ways that we can experience conflict in our relationships. 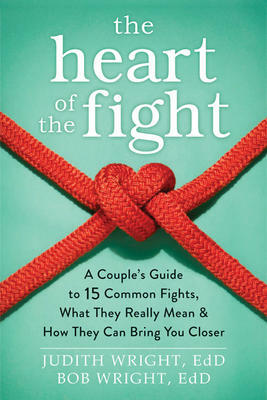 In my new book, The Heart of the Fight we discuss underlying reasons and catalysts in the myriad of conflict types that we can experience in our partnerships. We can experience a sexual distance or dissatisfaction, conflicts over money, household tasks, or soft addictions that can drive a wedge in even the closest of relationships. In between blame and accusations, and tears and frustration there are often many threads of truth that are interwoven into the conflict. Every fight stems from a yearning, a longing for acknowledgement of one’s feelings and sometimes simply noticing the truth and affirming the feelings behind it can be enough to dissipate the battle. How often in a fight have you known that what your partner is saying contains a nugget of truth? Often it’s that very truth that gets under our skin and frustrates us—we even hate to acknowledge it at all. In fact, that truth pisses us off. At the core of each conflict, each frustration, there is a yearning. Maybe the conflict isn’t even overt. Perhaps it’s just a built up under-current of negativity, of dismissive and distant behavior. Whatever it is, what’s the outcome you desire? If you’re longing for more support in your relationship, more intimacy, or acknowledgement, then why are you fighting about who needs to pick up their socks from the floor or put the toilet seat down? Even in the best relationships, there are things that irritate us. But before picking a fight or petty argument, examine the underlying issue. When your husband is watching the football game and you’re trying to respond to client emails, are you frustrated simply because the television is loud? In which case, when you ask him nicely to turn it down because you’re working, does he do it? If you have thoughts like, “Yes, but only one decibel and then he turns it back up five minutes later” or “He ALWAYS ignores my need for a quiet workspace.” Then maybe the underlying issue isn’t the volume of the television but rather the fact that you’re not feeling supported in your work. Too often we get caught in a cycle of nagging, resenting and whining, when we aren’t actually articulating the real issue at hand. Ultimately, the true yearnings behind our relationships and our needs are the drive for these seemingly small irritations. Acknowledge the truth behind the conflict, and fight for, not against, your desires. Sometimes we forget that “he” or “she” isn’t the enemy. Our partner ACTUALLY likes us and wants to be with us. Even if things have faded or you’re in the midst of some intense periods of transformation and you feel frustrated, angry, resentful or ignored—at one time, beneath it all, your partner decided they enjoy being with you. You decided the same about them. Hold on to that goodwill. So often when we’re engaging with our partner, things come out that might be hard to hear. We might be mean or say something we later regret. On the flipside, we might be hurt by a partner’s comment and withhold affection or passive-aggressively feel superior because we didn’t stoop to their level (still punishing behavior). Throughout engagement with our partner, we need to remember that there are certain rules we should follow to keep things fair and constructive. As your relationship grows, so will your connection to your partner. Working together strengthens intimacy. We come to know ourselves better as we view ourselves through the lens of our shared experiences and common goals. Transformative relationships support us and make us stronger and better versions of ourselves. There’s no one-size-fits-all formula for a relationship. Just when I think I’ve heard about every possible nuance or relationship story, something will come along that breaks the mold. So then how could I possibly write a book exploring truths about relationships that we can apply to everyone? There are very few universal rules or facts about relationships, but just like determining a personality type, there are a few commonalities that seem to hold true. The ideas we may have in our heads about typical relationships and what idealized love looks like may not apply to what we experience in real life. This, of course, makes us ask, “Am I normal? Is my relationship normal?”—as though there’s a magic formula to making things work. Yeah, forget the romantic comedies. Forget the fairytales. Forget the Hollywood interpretations of love. Love is messy—messier than that Hollywood stuff, messier than wicked-stepmothers and Prince Charming and sleeping spells. Love takes work. Couples don’t split up because they fight. They split up because they don’t know how to grow from conflict and use it as a catalyst to strengthen their relationship. One of the most concerning things I hear from couples is when one partner tells me that they never fight, while the other partner has a laundry list of resentments and feelings that they’ve never brought to the table. Intimacy, connecting with another person, and deep, meaningful relationships take work. They require messiness. There’s sweat and tears and all sorts of bodily fluids and it can get dirty. It can mean that things are said that not everyone in the relationship wants to hear, but these truths are expressed and both partners grow from these truths. They roll up their sleeves and do what it takes because despite being messy, love is also wonderful. A supportive, loving, intimate and fulfilling relationship can be the very fire of metamorphosis. It can be the catalyst for change, the womb to grow in and the guide for our journey. Change, like love, is rarely linear or clear cut, and it is almost always messy. Fighting Can Bring You Closer, So Learn to Fight. As I mentioned before, one of the most frightening things I can hear from a couple is that they “never fight” (particularly when it only comes from one person). Fighting can be scary, particularly if you were raised to be conflict-avoidant. However, contrary to popular belief, fighting can be a powerful tool for a couple to grow stronger. Time and time again, I hear relationship advice aimed at restoring couples to the early phases of dating—when they were just getting to know one another and just starting to engage. Whenever I hear this, I cringe! Who would want to go back to a time when they were less intimate and less involved? Couples that are strong have learned to fight productively. They’ve learned to use the rules of engagement to make themselves and their relationships stronger. When used properly, conflict and engagement can strengthen a couple’s bond. Issues that slowly erode relationships and resentments that build up over time are washed away. There’s no passive-aggression or hidden malice. Couples are engaged, communicating and much closer than they were back in those early stages of dating. You Need to Learn to Identify Your Yearnings. All human beings yearn—and those yearnings can be at the core of why we choose our relationships. What do you desire from your relationship? At the heart of every conflict is a yearning that’s not being met. This may be a desire for acknowledgement, to love and to be loved, a sense of belonging, intimacy, wanting to matter, or to trust. Understanding your yearnings helps you to boil down to the underlying motivation and reason for the conflict. Unlike wants, which are more direct and specific, yearnings are broader and can be met in a number of ways. Our yearnings are deeply ingrained and are evolutionarily adaptive. They’ve helped us to communicate, to express our needs, to bond and develop. When our yearnings are ignored, it can lead to feelings of conflict and resentment. We immediately feel a core threat and this can lead to a fight. The funny thing about yearnings versus wants is that we can often express our wants more easily than our yearnings. “I want you to stop drumming your fingers on the table” is a request that our partner may comply with, but ultimately it leaves them feeling nagged at, and it doesn’t make us feel any more fulfilled. At the core of the “want” maybe be that we yearn for our partner to acknowledge us; we yearn for our personal space; we want to be able to work in quiet because we yearn to be successful or for creative expression. Understanding our yearnings and identifying them can help us rematrix our core desires and many of the unmet needs from our childhood. Many of our yearnings are formed from interactions with our parents, siblings and throughout our youth. As we grow and adapt in our adult relationships these yearnings can still fuel our desires and interactions. They can arouse our conflict and resolve feelings that we may have previously ignored. Understanding these three facts about relationships can give you a greater insight into conflict and engagement. You can strengthen your relationship and find fulfillment and progress as you work together to make your bond and your selves stronger.